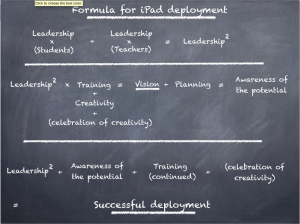 For those embarking on an iPad journey in a school, I’ve put together this formula. I hope this will help explain crucial elements that need some thought. The most important question you can ask your self, when embarking on this type of project is why? Why do we want our teachers and students to use iPads? A school shouldn’t invest so much time and money into a technology deployment, just because it’s easy to use. There needs to be a more detailed discussion around the awareness of how much this particular technology can support teaching and learning. The leadership team made up of staff and governors will ultimately make the final, important decisions, don’t forget the enthusiasm and skills of the students. Encourage and develop digital leaders from different year groups within the school to act as a student leadership team. 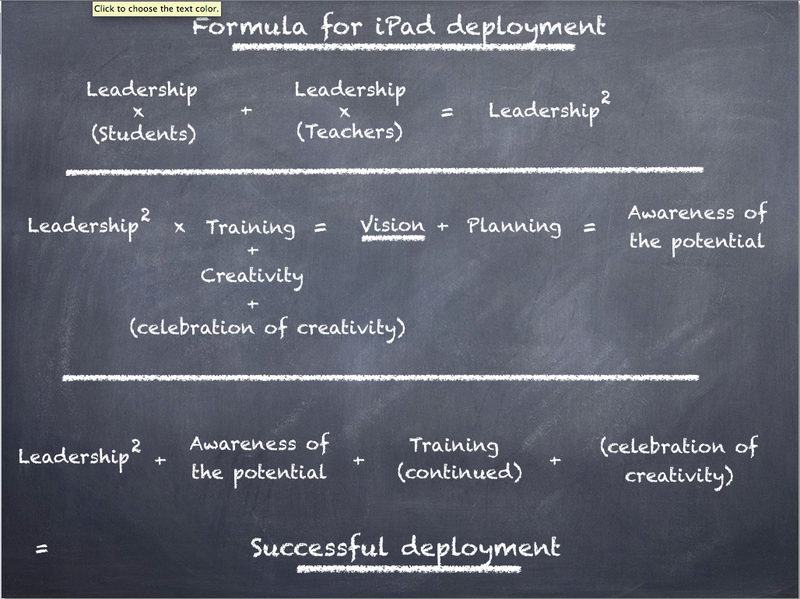 They can and do offer so much to an iPad deployment in a school. Helping their peers and teachers with ideas and technical support. One school I’ve worked with created their own student run genius bar, in an old broom cupboard! They offer iPad support to teachers as well as students, during their lunch break. Video with voice over, explaining formula. PreviousPrevious post:Choosing a case for your iPad deployment.NextNext post:Is the Chromecast an Apple TV replacement in the classroom? Choosing a case for your iPad deployment.